Having done decently so far, Anand ran out of steam in the last round and was outplayed by Wang Hao. Anand remained at sixth spot in the world rankings and stands to gain seven rating points from his efforts here. World champion Viswanathan Anand suffered a shocking last-round defeat against Wang Hao of China and had to be content with a joint third finish at the 75th Tata Steel Chess tournament here. Levon Aronian of Armenia ended second on 8.5 points after a draw with out-of-sort Fabiano Caruana of Italy. Anand with eight points in all tied for the third spot with the other winner of the day - Sergey Karjakin of Russia. After a spate of draws in the last round Peter Leko of Hungary finished fifth on 7.5 points, a half point more than Hikaru Nakamura of United States who played out a draw with P Harikrishna in his final round game. Harikrishna finished seventh on 6.5 points in the 14-player round-robin event and is set to become the third Indian after Anand and K Sasikiran to enter the 2700 rating club post his performance here. For the records, Anish Giri, compatriot Loek Van Wely and Wang Hao tied for the eighth spot on six points while Chinese girl Yifan Hao ended 11th with 5.5 points in all. Caruana, on five points, ended 12th while the Dutch duo of Erwin L'Ami and Ivan Sokolov ended on last two spots with four and three points respectively. 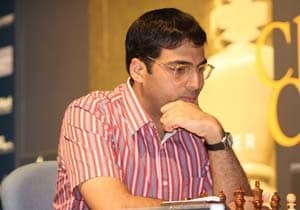 Anand faced the Scotch four Knights opening by Wang Hao widely known to give black a level position. However, it was a bad day in office for Anand when nothing went right. After the trading of queens in the middle game, the Indian was saddled with a slightly inferior position and Wang Hao used his queen side pawn majority to perfection to score one of the biggest victories in his career. Harikrishna yet again stood better. The Hyderabad based has proved here that he belongs to the big league and his performance here is likely to reap in more invitation to strong tournaments. Playing black against Nakamura's irregular opening, Harikrishna won a pawn with some imaginative display but a momentary lapse in concentration saw the American climb back in the game. The ensuing knight and pawns endgame was just a draw after Harikrishna gave his knight and pocketed the last remaining pawn of white.